Shopping, camping, TRAVELING and having a good time! Or when Veronica and I were dropped off at a party by our parents. It was a punk party-but my mom thought they were wearing Halloween costumes. Those were the good old times! Miriam Calvillo Servin has a birthday today. My son Michael and My Princess Natalya and me! My son Michael and my sister Madeline who was Prom Queen last year! My son and my brother JR! 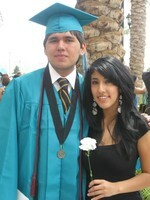 My sister Veronica (proud aunt) and Michael! This is my mom and proud grandmother of her 1st grandchild graduating! Is grandpa still asleep in the Arena...We can't find him! 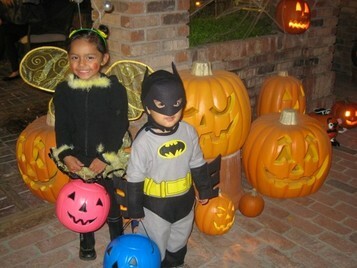 This is my Princess Natalya and Big Bro! Mi Familia! My other son Adrian (14) in front of picture. This is my brother's graduation afterparty. 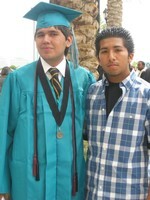 Ruben graduating from Mojave High School 2009! La Familia!